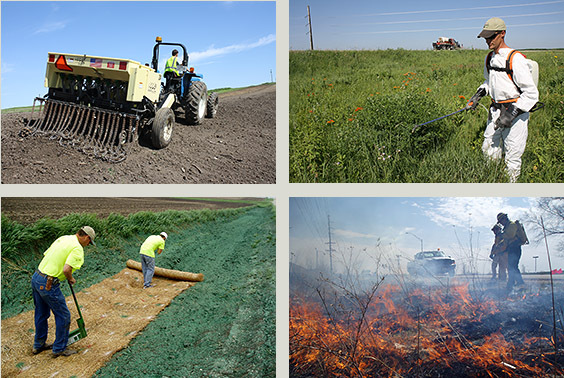 The Integrated Roadside Vegetation Management (IRVM) Program Office at UNI provides technical assistance, training and education to Iowa’s county roadside programs. Integrated roadside vegetation management is an approach to right-of-way maintenance that combines a variety of management techniques with sound ecological principles to establish and maintain safe, healthy, functional roadsides. IRVM includes judicious use of herbicides, spot mowing, prescribed burning, mechanical tree and brush removal and the prevention and treatment of erosion and other disturbances to the right-of-way. A long-term IRVM objective is to establish diverse stands of native plants in the right-of-way. These strong, weed-resistant plant communities adapt to all roadside conditions and provide a variety of services: enhancing rainfall infiltration; slowing runoff; trapping sediment; reducing erosion and creating habitat for pollinators, nesting birds and other wildlife. Iowa’s IRVM objectives were first outlined in Iowa Code 314.21 and 314.22. This 1988 legislation created funding for the IRVM Program Office at the University of Northern Iowa through the establishment of the Living Roadway Trust Fund. In addition to providing a variety of resources to Iowa’s county roadside programs, UNI's IRVM Program Office also provides guidance and support to Iowa counties establishing new IRVM programs, and strengthens IRVM statewide through partnerships with the Iowa Department of Transportation and other agencies.